On Monday, Krasnodar governor Aleksandr Tkachyov dismissed Vasily Krutko, the head of the Krymsky district – the area that suffered most in the cataclysm. Commenting on his decision, Tkachyov said Krutko did not manage to handle the tasks of dealing with the emergency situation or its consequences. “For everyday tasks he was a fair manager and did a lot of things. But during a tragedy of such scale, with one out of two residents affected… it was not enough,” he said. At the same time, some opposition parties are urging an investigation into the actions of Tkachyov himself, which they say may lead to his resignation. The United Russia party, of which Tkachyov is a member, announced that it considers such statements to be political PR, dubbing them unacceptable and cynical. 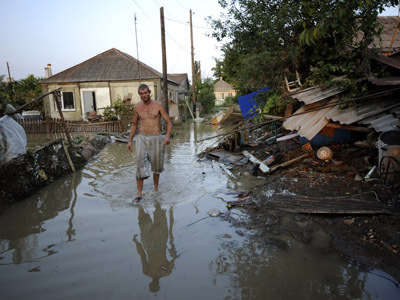 On Saturday, the Krasnodar region's cities of Gelendzhik, Krymsk and Novorossiysk were flooded as millions of tons of water raged through. 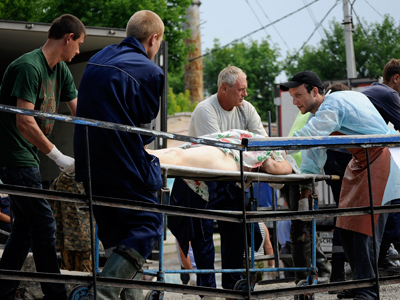 Krymsk suffered the most devastation and casualties. In the middle of the night, the town was submerged within minutes, locals say, with water reaching the second floors of residential buildings. The death toll from the disaster reached 171, with hundreds more injured. According to recent reports, some 35,000 people have been affected by the catastrophe. President Vladimir Putin demanded a detailed analysis of what went on during the flood be delivered to him personally by the end of the week. The group of investigators working on the case is inquiring into the work of the emergency services, the alerting system and the local dams. There are two large water reservoirs in the area. Shortly after the disaster, some suggested that the flood was caused by a breach in one of them, or the emergency discharge of water. The blogosphere was quick to pick up this version of the story, and widely speculated over it. 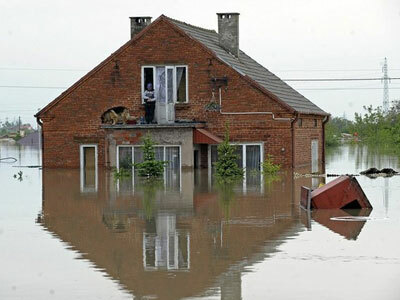 The examination of the Neberdzhaevsky reservoir, however, ruled out the conjecture that the flood was caused by emergency water discharge or improper functioning. So far, officials point to extraordinarily heavy rains as the cause of the tragedy. Meteorologists say the last time the region experienced rainfall of such torrential magnitude was 77 years ago. “This amount of rain during such short period of time is usual for equatorial and tropical zones, but not this region. This is almost a half of the yearly downfall for this area,” reads the official document provided by Russia's Agency of Hydrometeorology. The preliminary results of the investigation revealed that Krymsk's alert system failed to notify people of the upcoming catastrophe. Locals say they did not hear the emergency sirens. However, investigators have not yet finished their inquiry and have yet to announce final results. The regional emergency services reported that local authorities had received weather warnings two days before the disaster. They also say the Emergencies Ministry sent out weather warnings by text message through mobile operators. Governor Tkachyov admitted that the warning system needs development, adding that a better system will help avoid such tragedies in the future. 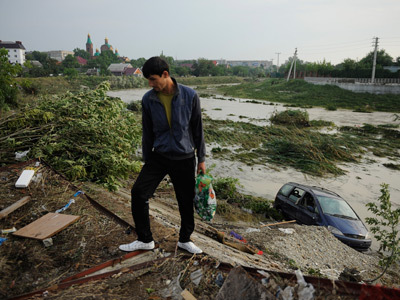 Convoys of trucks carrying aid for the flood's victims are making their way from Krasnodar, the region’s main city, to the affected areas twice a day, Krasnodar's mayor said Monday. 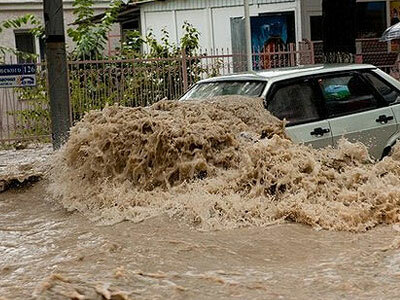 Authorities have begun providing financial compensation to the victims of the flood. Initial packages of 10,000 rubles ($300) per person can be obtained at local post offices. All in all, Putin announced that every family affected by the disaster will receive 150,000 rubles (about $4,600) in compensation. 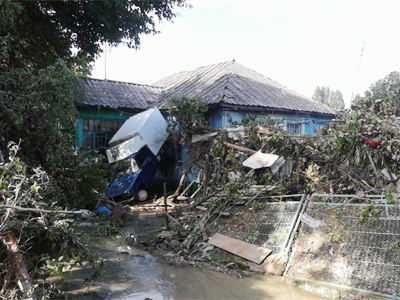 Additionally, two million rubles (about $61,000) will be paid to every family that lost a relative in the flooding. 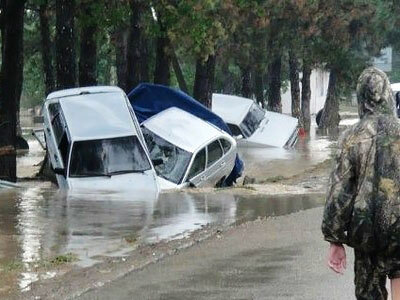 Thousands of people across Russia have united their efforts to help those suffering from the effects of the flood. Through social networks, they are organizing aid-collecting stations where volunteers can leave clothes and essential supplies for the disaster's victims. Money is also being collected throughout the country.